This article was written by Geoff Hall and first appeared in Oakwood and District Historical Society’s ‘Oak Leaves’ in Autumn 2001. [the illustrations have been added to the original article] We are very grateful to Margaret Hall for giving us permission to include her husband’s article on this website. At the turn of the 19/20th centuries Roundhay was a township forming, together with Seacroft, an unusual local government unit entitled Leeds Rural District. Thus Leeds officially had no jurisdiction within the township, despite owning a large area by its purchase in 1872 of Roundhay Park and adjacent land. At that time there were relatively few houses in the township and most of these were very substantial villas and private estates. To understand the way in which these developed into two distinct groups it is necessary to go back to the beginning of the 19th century and earlier. The township of Roundhay originated from a deer enclosure owned by the De Lacys of Pontefract, supporters of William the Conqueror. Such “haies” were approximately round, hence the name, which was given to the whole estate. Later owners abandoned the deer park and only a few scattered farms covered the area. The deer park had extended southwards almost to Foudary Lane and Westwards to the edge of Gipton Wood. Careful investigation in places reveals traces of the old surround, with hedges and trees along where the boundary with Leeds continued until 1912. There was no village or focal point in earlier times. In 1803 the whole township was sold to just two purchasers. The first was Thomas Nicholson, a London insurance broker, who acquired the portion to the west and north of the beck which was eventually to form the bed of Waterloo Lake, and also that to the north of the present line of Wetherby Road. The remainder was bought by Samuel Elam, a wealthy Leeds shipowner. At this time the population was less than 100 souls. 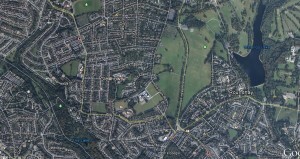 Nicholson and his successors developed their portion into the present Roundhay Park, with a further purchase of land to the east from Samuel Elam’s cousin, Robert Elam, in 1815. 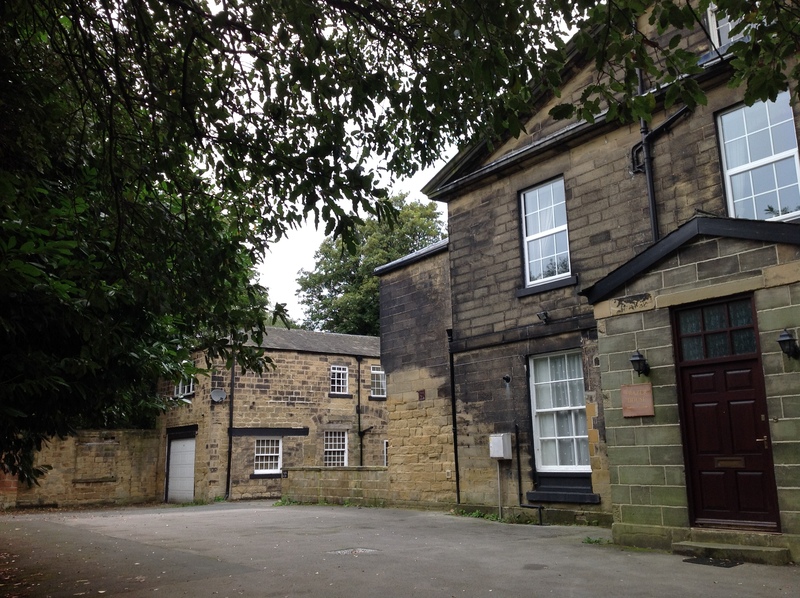 Earlier, in 1810, Samuel had become bankrupt and had to sell off his portion of Roundhay township in Lots. 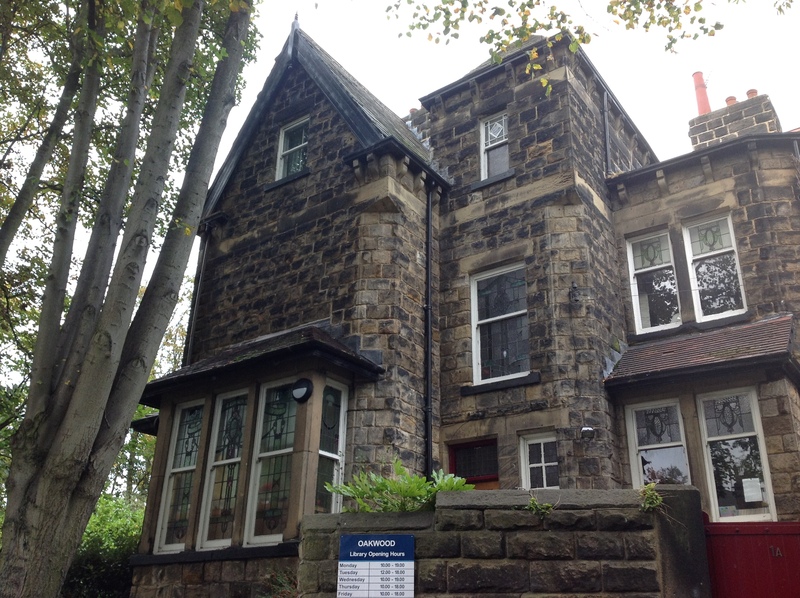 Some of these Lots were bought by a number of wealthy Leeds men and over the next two decades they built and developed country residences around the North Lane area. Many of these remain, such as Grove House. Eller Close and Springwood nearby, now called Fraser House. Further to the North Elmete , Elmete Hall and Beechwood were built on the higher ground off Elmete Lane enjoying magnificent views. By the 1840s the population of Roundhay had grown to around 450 largely due to the influx of retainers staffing the new estates. The Nicholson family established themselves as the local squires and gave Roundhay a long missing focal point by building St John’s Church in 1826. Early in the century a turnpike road from Leeds to Wetherby had opened access to Roundhay. The Church was adjacent to this road which also gave access to the main entrance to the new Park. Before the turnpike, the way from Leeds to Wetherby came in through the southern edge of the township by way of Dib Lane, Asket Hill and over Elmete Lane to Shadwell. In 1868 the “reigning” Nicholson died and by his will the estate had to be sold. A group of Leeds businessmen led by the Mayor John Barran purchased the park and it associated outlying land, with the idea of the Park providing recreation for the people of Leeds and the remaining land being sold off for high class housing. 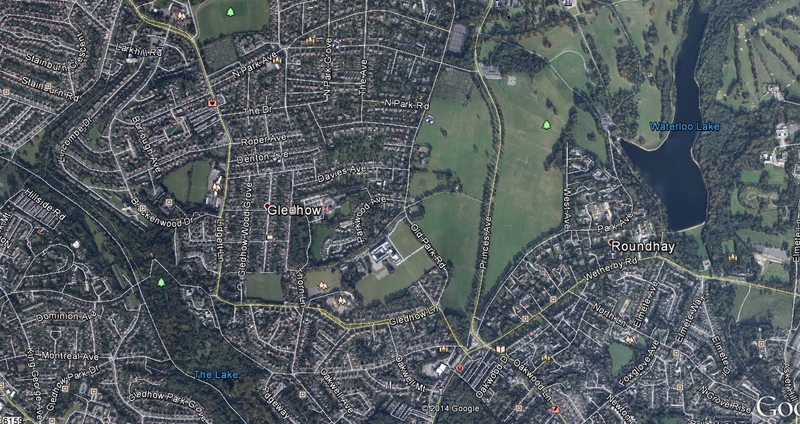 Leeds Corporation could not buy the estate at first because it was outside the town boundary. An Act of Parliament authorising the purchase was passed in 1872, and the Park was officially opened by H.R.H Prince Arthur, Duke of Connaught, in September that year. As soon as possible, building plots were put on offer, but these were slow moving because of the remoteness of Roundhay from Leeds and the lack of adequate transport. However, Park Avenue and West Avenue were laid out in 1878 and began development of two high-class “mini estates” called Carr Head and Parc Mont, whose owners had the advantage of private carriages for driving into town. Both properties still stand, the former renamed Woodlands. Map showing the area first developed and the current layout of some of the streets referred to in the article. (demolished in 1937). Once the tramway was available, business flourished and a housing boom began. Villas appeared on new streets around Old Park Road, for example Park Villas, still standing. Along Wetherby Road from Oakwood stone-built properties included mainly large villas on the north side, with more modest but still large, detached properties on the south side. 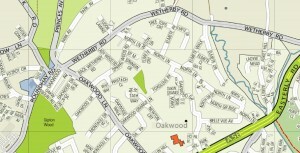 A few roads of smaller houses to the South of Roundhay Road west of Oakwood Lane were built with Oakwood Lane and Boundary Road marking the division between Leeds and Roundhay. Other services complemented the trams, Until after the 1914-18 War a few farms remained between the houses at the North end Oakwood Lane and York Road. 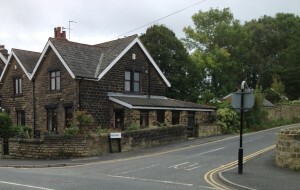 View of Oakwood Library situated on Oakwood Lane beside the junction with Roundhay Road and Wetherby Road. Set in extensive grounds, it was formerly a private house before opening as Oakwood Library and Police Station in February 1955. The police station vacated the building in 1961 allowing the library to expand. 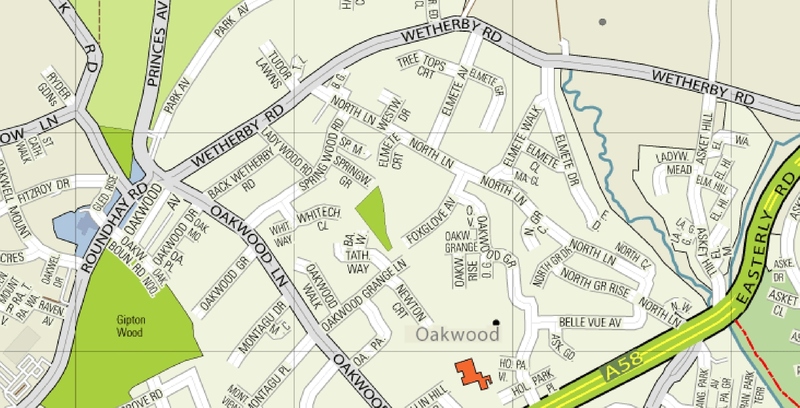 An early Police Station at Oakwood corner was later relocated to the eastern end of the township where Asket Hill joins Wetherby Road. It is there to this day as a private residence. The old Post Office was joined by one parade of shops in 1898, followed by a second row in 1900 that included a Bank. All these served the needs of the growing upper-class population, and Oakwood was the logical site for this business development in the new suburb of Roundhay. The days of Leeds Rural District ended in 1912 when the Leeds boundaty was extended to include Roundhay and Seacroft. The construction of Easterly Road in 1926 opened up a large area for house buliding and the once countrified area vanished forever. Happily, the People’s Park still flourishes.